While making Kombucha is easy and adaptable, usually new home brewers have questions about the two different methods, Kombucha Continuous Brew vs Batch Brew. Even worse, many “expert” websites offer confusing or flat out wrong information, especially about Continuous Brew. Never fear! Here we will explain the advantages of each to help decide which is right for you. Or maybe you will try both at the same time like we do! As long as you are enjoying the flavor and the process, there is no wrong way to make Kombucha. 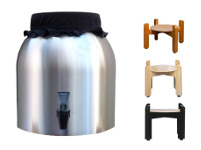 Whether trying Batch Brew or Continuous Brew, most of the brewing supplies are the same. 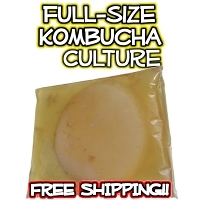 Your tea, sugar, filtered water, a high quality Kombucha SCOBY with strong starter liquid (1 per gallon), and a tightly woven cloth covering (no cheesecloth) can be used with either method. 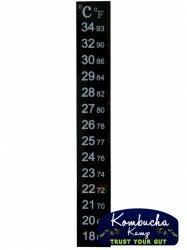 Recommended temperature ranges and brewing safety tips are the same as well. The most important difference between the two ways is the vessel. 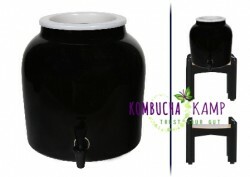 For Batch Brewing, any 1 gallon or larger vessel will do, assuming it is a safe material for brewing Kombucha of course. 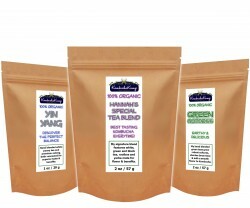 The standard Kombucha recipe makes 1 gallon, but can be scaled up to make larger Batch Brews if the vessel allows. Glass jars are commonly used but ceramic, wood and stainless steel are also options. For Continuous Brew, the minimum recommended vessel size is 2+ gallons. Even more important, your Continuous Brewer must have a high quality spigot. This is because many of the benefits of CB require us to be able to dispense delicious Kombucha right from the spout without removing or handling the large SCOBY inside. What does “high quality spigot” mean? Because Kombucha has a low pH, meaning it is acidic, the material and construction of your spigot must be safe when submersed in the liquid. The spigot must be of a brew-safe, corrosion resistant material and free of all paints or epoxies. 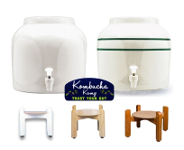 Click here to learn how to select a spigot for your Kombucha Container. No matter which method you use, there are many factors that determine how long it takes to brew. The quality of the SCOBY(s) and starter liquid, how much SCOBY and starter liquid you use, as well as the temperature of the brew, are just a few factors that will affect the speed. Your ideal cycle depends on all the factors above plus your personal taste preference. The longer it brews, the more sour it becomes, so taste regularly. For a 1 gallon Batch Brew, you might expect it to be ready in 7-14 days. Some people prefer to brew longer, up to 30 days. Each time, the brew will take about the same time. For Continuous Brew Kombucha, we generally start with a 2 gallon vessel of sweet tea. Because it is larger, the first brew may take 10-21 days on average to be ready. However, once we like the flavor and decant up to 1 gallon via the spigot, we will add back that 1 gallon of sweet tea to combine with 1 gallon of already fermented Kombucha. That mix means the next Continuous Brew will be ready more quickly, usually in 5-7 days. Future re-fills of the CB container are then fermented even faster, so that new Kombucha can be ready in about 3 days. As the CB vessel becomes more full with SCOBY and strong starter liquid, it may be possible to remove up to 75% of the liquid for drinking. Which Brew is For You? 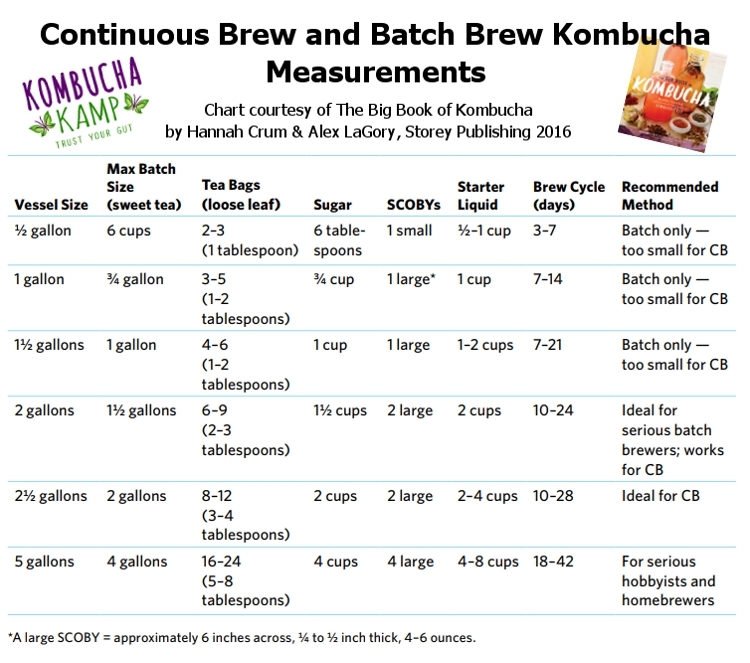 You might be wondering, “So if Continuous Brew makes more Kombucha, faster, with less effort, why doesn’t everyone use the CB method?” It seems obvious! Unfortunately, some people avoid CB based on bad advice or fear. Most of the so-called “drawbacks” of CB are simple misunderstandings about the best techniques and tricks for brewing success. Well-meaning bloggers can fall into the trap of spreading this confusion, but in fact Continuous Brewing fits most home brewer’s needs best. Mainly because it’s less work, and who doesn’t like that?! That said, there are legitimate reasons to choose Batch Brew too. Here are some Pros and Cons of both. 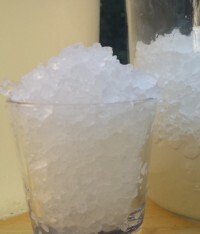 Some people say Continuous Brew is the “new way” to brew and Batch Brew as the “traditional way”. 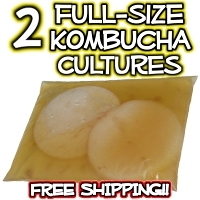 However, Kombucha legends point to CB as the ancient method, with origins in China or Russia. There the grandmother of the extended family home would lovingly tend her Kombucha pot, doling out cups to the family and then filling it up with the spent dregs of the teapot and a little sugar. 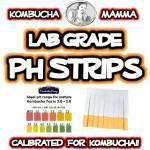 Grandma may not have known (except in her gut) that CB is the safest, easiest and healthiest way to brew Kombucha. Luckily, we do, and that’s why we choose Continuous Brewing. No matter which style you opt to go with, they will both yield delicious Kombucha with nutrients in a living form. Try them both to see which works best for you! You may hear these “complaints” about Kombucha Continuous Brew from those who prefer Batch Brewing. No worries, these concerns come from fear or confusion. Get the real deal below! The SCOBYs and liquid in an older CB are just the same as in a SCOBY Hotel, meaning they are excellent for making more Kombucha. If the brew gets sour, the solution is always simple: drain a portion and refill. Occasionally maintenance is required, but the overall effort is much less than Batch Brew.“It makes too much, I only need a little”. Continuous Brew is just as flexible as Batch Brew but requires less time to be ready. False! If you don’t want to make more Kombucha right away, just decant what you need into bottles and then leave the vessel alone until you are ready. The CB acts as its own SCOBY Hotel in the meantime. Not true at all! The SCOBYs can survive just fine for many weeks or even months in the vessel, waiting until you feed them again. If they dry out or are left alone too long, mold may form, but that’s the same as for Batch Brewing. Not at all! 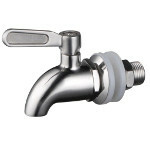 It’s true that sometimes the spigot will become clogged with yeast or SCOBY, but it happens rarely (less often with stainless steel spigots as the opening is wider). When it does, you only need to use a small spigot brush (included with KKamp CB packages), or even a toothpick or paperclip, to dislodge and get back to enjoying the brew. There is no need to empty the vessel. This is a problem in any method, so taste regularly to avoid. But with CB, if it does get too sour, you can drain a gallon, refill, and have fresh Kombucha ready in 3-4 days. Whereas with Batch Brewing, if you miss your harvest date, you’re waiting the full brew cycle to get more booch, perhaps a full 2 weeks. We agree! This applies to Batch Brewers who do not keep a Hotel too. Always keep a SCOBY Hotel separately, regardless of your brewing method. While this is true for the first 2-3 cycles, after that the CB timing is predictable, based on your personal taste preference and brewing environment, the same as Batch Brew. Generally 3-5 days after adding sweet tea, the CB will be ready for bottling again, and if your conditions remain consistent, so will your bottling day. Actually while the yeast settle at the bottom, they create a very low layer that is below the level of the spigot. In fact, when decanting we often want to get MORE yeast into the bottle for better carbonation. As such, we recommend giving the CB a little stir prior to bottling, so that more yeast is present in the Kombucha. This has the added advantage of reducing the overall yeast in the vessel. This helps the vessel maintain a balanced flavor and extend the time before vessel cleaning is required.